Message summary: Rest in this blessed assurance; God and His Word provide the steady anchorage and sure foundation for the soul. Today let us focus on the immutable God, whose Word has promised: “You will keep in perfect peace him whose mind is steadfast, because he trusts in You. Trust in the LORD forever, for the LORD, the LORD, is the Rock eternal” (Isaiah 26:3,4). “We who have fled to take hold of the hope offered to us may be greatly encouraged. We have this hope as an anchor for the soul, firm and secure” (Hebrews 6:19). Stunning views of the Golden Gate Bridge can be seen throughout the San Francisco. 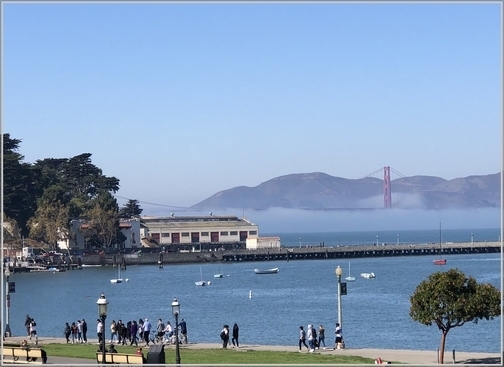 Today’s photo shows the fog coming in under the bridge from Fisherman’s Wharf. 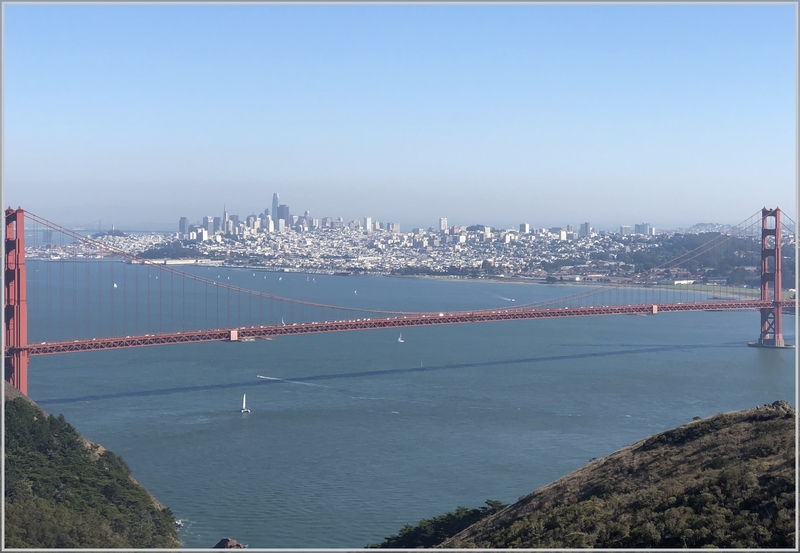 On Monday we shared a photo of the bridge and city skyline from a scenic overlook in Marin County on the other side of the bridge from the city. There are views where all you see is the top of the towers. But a special sense of the immensity of the bridge is attained when you walk across, which we did the first full day we were out there. It’s about 3 miles to go from the parking lot on the San Francisco side to the anchorage for the cables at the far end of the Bridge and then walk back. But we did it, the longest single walk we believe Ester ever did! I enjoy viewing the bridge from an engineering perspective. I’ve wondered what it would be like to pretend I was an engineer with a role in designing a massive project like this. In the early thirties they didn’t have computers and CAD so they did a lot of calculating and plotting on paper. I would have preferred to work on the design of the massive towers or cables, two bridge elements that immediately catch your attention. Likely though, for the typical pedestrian, a lot less attention and appreciation is given to the four huge concrete blocks, two on each side of the bridge. These are known as the cable anchorages, which form a vitally critical role in the structure and much thanks should be given to the engineers who designed and workers who built these. There are 182,000 cubic yards of concrete in these anchorages, along with the pylons and cable housing. The function is to anchor the massive main cables that hold up the bridge. You can see in the photo above the main cable going into the anchorage. The cable anchorage serves a vital role in securing this cable. If the cable slipped out there would be catastrophic consequences. Today let us consider the anchorage for the soul based on one of my favorite Scripture passages. Of course the allusion here is to a ship’s anchor, not the anchorage for a bridge cable, but the principle is the same. How thankful we should be for the blessed anchorage of hope we have in Jesus! This anchorage is eternally firm and secure. The daily verse is the only place in the Bible where the word “anchor” is used figuratively. It is used literally in Acts 27 during Paul’s shipwreck. The Greek word is Aγκυρα, pronounced “ankura” (our English is merely a transliteration of this word). The anchor was used in the Greek world as a picture for hope. Believers all throughout the ages have received assurance in their hearts as they consider the security an anchor provides in the midst of battering storms. I am so gripped by the early part of the daily verse, “We who have fled to take hold of the hope offered to us may be greatly encouraged“. Although I have valued this verse for many years since I was a young Christian and in fact have often alluded to it in these daily encouragement messages today the words “greatly encouraged” especially jumped out. This hope is what the believer has “fled to take hold of”. The worldly sources of hope are temporal and short sighted. The hope Jesus offers is the only true and lasting source of hope. Once we firmly take hold of this hope we are indeed “greatly encouraged”. Perhaps you’re in a wind-tossed storm as you read this. Or there may be a storm on the horizon. Today we want to encourage you to ground your faith in the anchorage that is immovable that will weather the worst storms of life. Truly, this anchorage of hope we have in Jesus Christ is firm and secure! Rest in this blessed assurance; God and His Word provide the steady anchorage and sure foundation for the soul. Today let us focus on the immutable God, whose Word has promised: “You will keep in perfect peace him whose mind is steadfast, because he trusts in You. Trust in the LORD forever, for the LORD, the LORD, is the Rock eternal” (Isaiah 26:3,4). Daily prayer: Father, help us not to resent the storms of life or be fearful of their effects. Much like we prepare for a ravaging storm by anchoring valuables to a firm foundation, help us to anchor our souls in the firm foundation of Your Word that will help us to withstand the testings and trials of life that are certain to come our way. 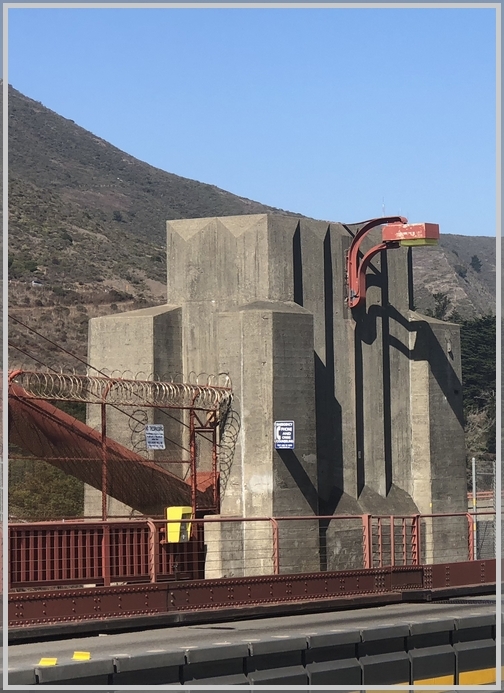 Even as the huge cable anchorages of the Golden Gate Bridge have stood the test of time, may we have an assurance of Your absolute reliability, not for the years of time alone, but for eternity. Amen. Contemplate this thought-provoking quote: “In order to realize the worth of the anchor, one needs to feel the stress of the storm.” Faith is put to the test and best demonstrated during the deepest of trials. I never thought about this until preparing today’s message: How did Anchorage Alaska get its name? That it served as a port of anchor is the way in which Anchorage, Alaska, got its name. Anchorage owes its development to its usefulness, not as a fishing or mining center but as a port of anchor for the railroad-building activities of the Alaska Engineering Commission in 1914. 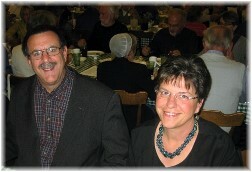 Finally today: Here’s a heartwarming love story that took place where we served a church in the nineties in Taunton, MA Video We met a couple, Bob and Joan, many years ago that share the same experience and we shared their story here.